Are you brave enough to take on The Drop? 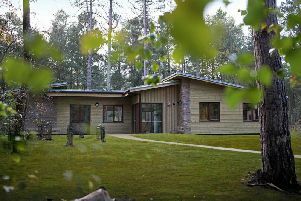 A new leisure activity which tests the bravery of those daring to take the challenge has opened at Center Parcs Woburn Forest. The Drop is the latest leisure activity to open to guests on a short break at Center Parcs Woburn Forest in Bedfordshire this autumn, following its popularity at Center Parcs Elveden Forest in Suffolk. The adrenaline-fuelled activity takes guests one way up a 10 metre outdoor tower, then gives four choices for their descent back down to ground, with different levels to test their bravery. On one side of The Drop tower is a double drop zip wire, where guests clip into a safety system and zoom across a clearing. Another option is the quick jump, where guests step off the wooden platform and experience a zero gravity freefall before their harness takes their weight and lowers them gently to the ground. For those who like an extra challenge, the Leap of Faith requires guests to jump from the platform towards a suspended punch bag, dangling in mid-air and try to hang on for a moment before letting go and being lowered back down to earth. Participants can tailor the difficulty of this level, by choosing the distance between the punch bag and the platform, making the leap shorter or longer. The pinnacle of The Drop, located at Action Challenge, is the Air Bag jump. Here guests leap from a platform, with no harness or rope, and freefall until landing safely on a giant inflated cushion. Nerves can be tested with jumps from the warm-up 4.5 metre platform, then the intermediate 7 metre platform, before taking on the ultimate challenge: jumping off the 10 metre platform*. Suitable for adults and children aged 8 years and over, The Drop is described as an activity that families can enjoy together, allowing the adventurous ones to soar whilst enabling more tentative family members to take part at a level they’re comfortable with, building their confidence along the way.